FC Dallas' Andrew Jacobson (4) and New York's Teemu Tainio (2) battle for a header during a Major League Soccer playoff match at Pizza Hut Park in Frisco on Oct. 26, 2011. FC Dallas battles New York during a Major League Soccer playoff match at Pizza Hut Park in Frisco. Named in this slideshow are: Andrew Jacobson, Dax McCarty, Brek Shea, Jair Benitez, Andrew Jacobson, Teemu Tainio, Tim Ream and Marvin Chavez. 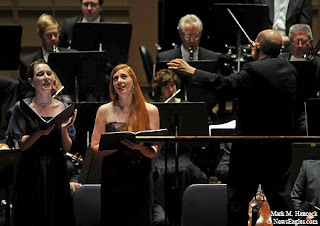 Sopranos Ava Pine, left, and Layla Claire, center, sing as Jaap van Zweden, right, conducts the Dallas Symphony Orchestra as they perform part of the Mendelssohn series at the Morton H. Meyerson Symphony Center in Dallas on Sept. 29, 2011. Jaap van Zweden conducts the Dallas Symphony Orchestra as they perform part of the Mendelssohn series at the Morton H. Meyerson Symphony Center in Dallas. Named in this slideshow are: &nbsp Jaap van Zweden, Ava Pine, Gregory Warren and Layla Claire. Oklahoma wide receiver Ryan Broyles (85) takes a hit from Texas cornerback Quandre Diggs (28) during a college football game in Dallas on Oct. 9, 2011. 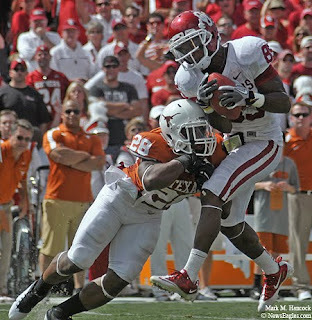 The University of Texas battles Oklahoma University in the Red River Rivalry during a college football game at the Cotton Bowl during The State Fair of Texas in Dallas. Named in this slideshow are: Austin Dunlap, Peyton Wyatt, Bevo, Hayley Gurwitz, Tim Lucas, Ashlea Poirot, Gabe Ikard, Malcolm Brown, Tony Jefferson, Landry Jones, Fozzy Whittaker, Blake Gideon, Ryan Broyles, Kenny Stills, Adrian Phillips, Quandre Diggs, Case McCoy, Travis Lewis, Ronnell Lewis, David Ash, Mike Davis, Jaxon Shipley and Demontre Hurst. 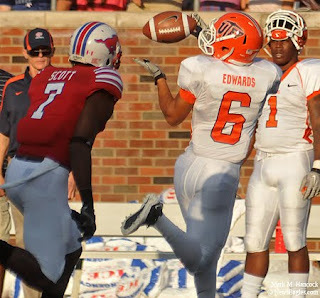 UTEP wide reciever Mike Edwards (6) makes a reception in front of SMU defensive back Jay Scott (7) during a college football game at Ford Stadium in Dallas on Sept. 10, 2011. Southern Methodist University battles the University of Texas at El Paso during a college football game at Ford Stadium in Dallas. Named in this slideshow are: Keenan Holman, Vernon Frazier, Cameron Smith, Mike Loftus, Mike Edwards, Jay Scott, J.J. McDermott, Donavon Kemp, Ja'Gared Davis, Cole Beasley, Kyle Padron, Derrick Morgan, Drew Thomas, Taylor Reed, Cameron Rogers, Zach Line, Josh Fely, Nick Lamaison, Taylor Thompson, Kenneth Acker, Joe Banyard and Jay Hall. 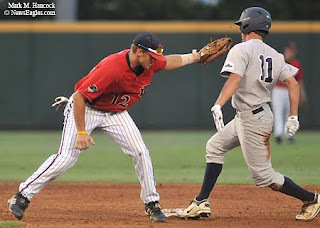 Oral Roberts' senior Joey Winiecki (11) dodges the glove of Dallas Baptist's junior Joel Hutter (12) after stealing second base during the NCAA regional baseball championship game in Lupton Stadium at Texas Christian University in Fort Worth on June 5, 2011. Oral Roberts battles Dallas Baptist during the NCAA regional baseball championship game in Lupton Stadium at Texas Christian University in Fort Worth. Named in this slideshow are: Bob Keller, Will Lane, Duncan McAlpine, Chris Elder, Nick Baligod, Tyler Robbins, Jared Schlehuber, Mark Guest, Bennett Pickar, Kenny Hatcher, Cam Schiller, Brandon King, Joey Winiecki, Dan Heefner, Michael Smith and Joel Hutter. FC Dallas' Ricardo Villar (11) tries to chest the ball as Vancouver's John Thorrington (11) kicks the ball during a Major League Soccer match at Pizza Hut Park in Frisco on Oct. 15, 2011. FC Dallas battles Vancouver during a Major League Soccer match at Pizza Hut Park in Frisco. Named in this slideshow are: Marvin Chavez, Michael Boxall, Jay DeMerit, Daniel Cruz, John Thorrington, Gershon Koffie, Jackson, Shea Salinas, Ricardo Villar, Brek Shea and Jordan Harvey. 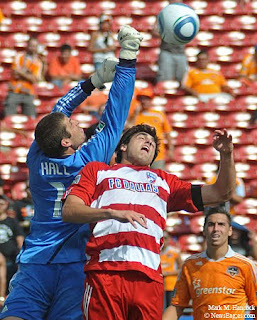 Houston goalkeeper Tally Hall (1) punches away a high pass for FC Dallas' George John (14) during a Major League Soccer match at Pizza Hut Park in Frisco on Sept. 24, 2011. Houston battles FC Dallas during a Major League Soccer match at Pizza Hut Park in Frisco. Andre Hainault, Jair Benitez, Jackson, Geoff Cameron, Adam Moffat, Ricardo Villar, Andrew Jacobson, Brian Ching, Tally Hall, George John, Luiz Camargo, Kevin Hartman, Marvin Chavez and Jack Stewart. 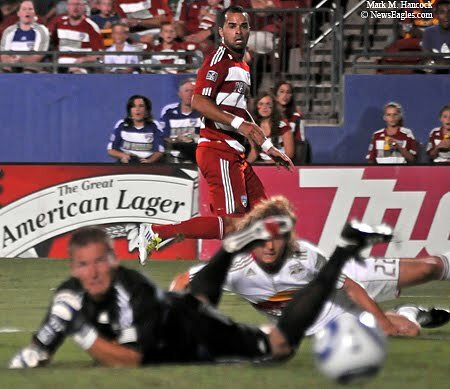 FC Dallas' Maicon Santos (9) watches as his shot gets past New York Red Bulls' goalkeeper Frank Rost (1) and Stephen Keel (22) but misses the goal during a Major League Soccer match at Pizza Hut Park in Frisco on Sept. 17, 2011. 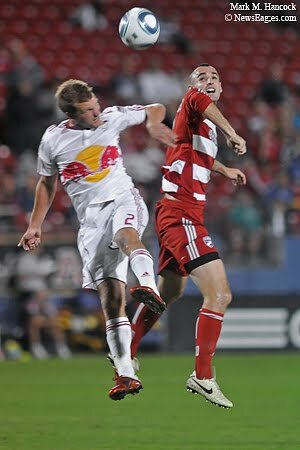 FC Dallas battles the New York Red Bulls during a Major League Soccer match at Pizza Hut Park in Frisco on Sept. 17, 2011. 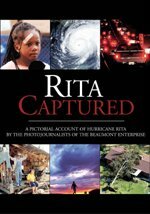 Named in this slideshow are: Bobby Rhine, Jair Benitez, Juan Agudelo, Stephen Keel, Maicon Santos, Daniel Cruz, Teemu Tainio, Chris Albright, Ricardo Villar, Frank Rost, Carlos Mendes, Jackson and Andrew Jacobson. 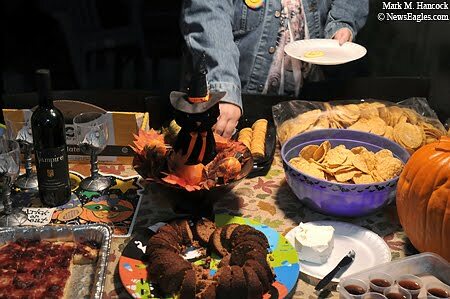 Snacks greet friends during a Halloween costume party in Garland on Saturday, Oct. 29, 2011. Friends celebrate during a Halloween costume party in Garland on Saturday, Oct. 29, 2011.